Ocean had scored a #1 hit last Christmas with ”WWF Wrestlemania”, and hoped for a repeat in the form of ”WWF European Rampage”. While the earlier title had been panned by critics, the publisher were adamant this one would be better. Commodore had announced the A4000 which, with a £1999 price tag, was very much targeted at the serious user. 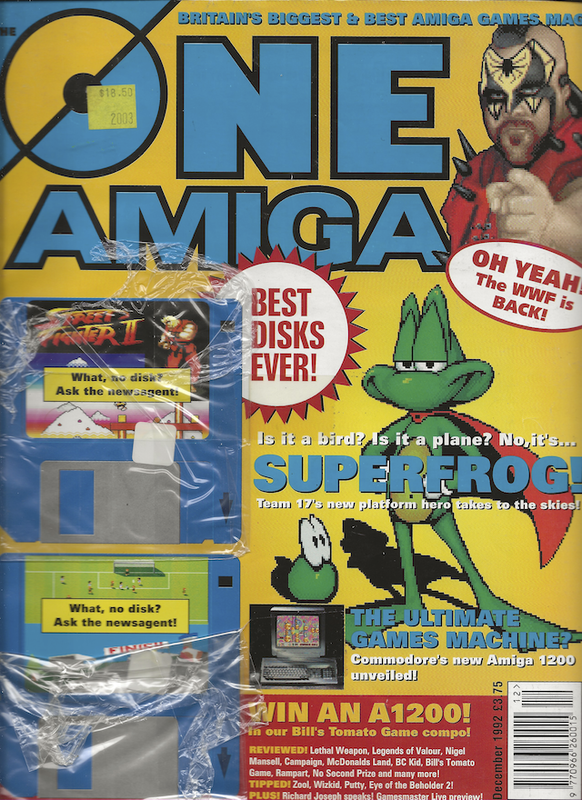 This fuelled rumours of a more affordable gaming machine and right as the mag went to press it looked like they had news... though that would have to wait until next month. French software house Silmarils were working on “Bunny Bricks” (which combined Breakout style action, Baseball and rabbits) and political strategy game “Transarctica”. Grandslam bundled up 10 of its older titles in “The Grandslam Collection”. “The Psycho Soccer Collection” was branded with England defender Stuart Pearce’s face and featured “International Soccer Challenge”, “World Championship Soccer”, “Manchester United” and “Kick Off 2”. There was no reason given, but Konami’s “Batman Returns” was no longer being developed by Rage and had been moved to Denton Designs instead. Konami also admitted that “Frontier” may slip into 1993. The CDTV hadn't proved much of a success and Commodore hoped a 100 quid price cut would spur things on. The Starter Pack was now £399 while the Multimedia Pack was £499. With the tendency for publishers to snap up the rights for anything resembling a blockbuster movie, The One wondered why “Patriot Games” had received no such love. “Street Fighter 2” was the hottest arcade game on the planet and it was heading to the Amiga. The One caught up with the devs to see how it was going. According to Producer Tony Bickley, “I sincerely think that this is going to be the best beat-‘em-up ever!”. A long preview of “Gunship 2000”. The One paid Arcane Developments a visit to check out their new isometric 3D adventure game, “Darkmere”. Gary Whitta got to try the Amiga port of “Desert Strike” at EA’s Langley headquarters. An in-depth interview with Jon Hare and Chris Yates of Sensible Software, who had just clocked up a record breaking 15 weeks at number 1 on the charts with “Sensible Soccer”. The fourth instalment of Andrew Braybrook’s dev diary for “Uridium 2” saw him have one too many with The One crew and miss his trainstop, work on the title screen, put together a demo for ECTS and juggle RAM. Team 17 were having another crack at the beat 'em up genre with "Body Blows", along with a top down racer, "Overdrive". Rumours started to circulate that there was yet another Amiga model on the way: the A800. It would be a 32bit machine with 68030 CPU and would sit between the A600 and the A1500. Commodore's Market Director Kelly Sumner was adamant there would be no machine called the A800, but did confirm there was another machine on the way... I assume it was the A1200. Alternative Software snapped up two popular UK TV show licenses: "Doctor Who: Dalek Attack" and "'Allo 'Allo". Following on from their MiG flight sims, developer Simis had turned their attention to the Harrier Jump Jet. "Harrier Assault" would once again be published by Domark and would also include a strategy element which would see the player assume the role of Commander of the Rapid Response Force. It just so happened that Vektor Grafix & Microprose had their own Harrier game due around the same time. Domark also planned to release a head-to-head multiplayer add on pack for "MiG 29 Superfulcrum". Anco announced that "Kick Off 3" would be their final title for the Amiga as they were going to focus on the Sega and Nintendo consoles. Team 17 were hoping to get Vic Reeves and Bob Mortimer to lend their voices to "Superfrog", but the comedy duo turned them down. "Silly Putty" was a rather nice looking puzzler/platformer from System 3. There was some further re-shuffling of the magazine's editorial team with Jim Douglas leaving to head up EMAP's Nintendo mag, and Dave Upchurch stepping into the editor role. Soccer games were popular, as were pinball games... so Codemasters figured why not kill two birds with one stone with "Soccer Pinball". Psygnosis were promising that "Armour-geddon II" would be "much better than the original". Not to be left out of the sequel action, Domark were to follow up their world cup rugby game. A rolling demo of "Flashback". Playable "Match of the Day" demo. Ten exclusive levels of "Skweeks". And these Public Domain games: "Nebula", "War" and "Croak". Part 2 of an exclusive look at "Frontier" - you can probably tell Gary Whitta was a tad impressed by the fact that the cover for this issue sported the question: "Is Braben God?". Whitta also visited Vivid Image Design to check out "The Second Samurai". Following on the success of "Another World", French software house Delphine dished some details on "Flashback" (which I'm pretty sure was a completely unrelated title, but really looks as if it were). The second instalment of the "Uridium 2" dev diary saw Andrew Braybrook implementing his sprite multiplexor, squashing bugs in the shawdow plotter and going to see Spinal Tap at the Royal Albert Hall. Featured in this month's PD Zone were: "Quick Money", "Biplanes 2", "Mr Brick", "System 4", "The Ultimate Gameboy Simulator". "Premiere" Core Design - 81% "As platform-based arcade adventures go, Premiere is certainly one of the most polished, and amongst the most fun to play as well." "Shadow of the Beast 3" Reflections/Psygnosis - 90% "It's difficult to mix two genres and make the resulting game work, the tendency being or it to fall between two stools and hence not really appeal to fans of either game style. In Beast 3's case I'm pleased to say (and I bet you saw this coming) that Psygnosis and Reflections can be justly proud of Beast 3 - they've got the mix just right."